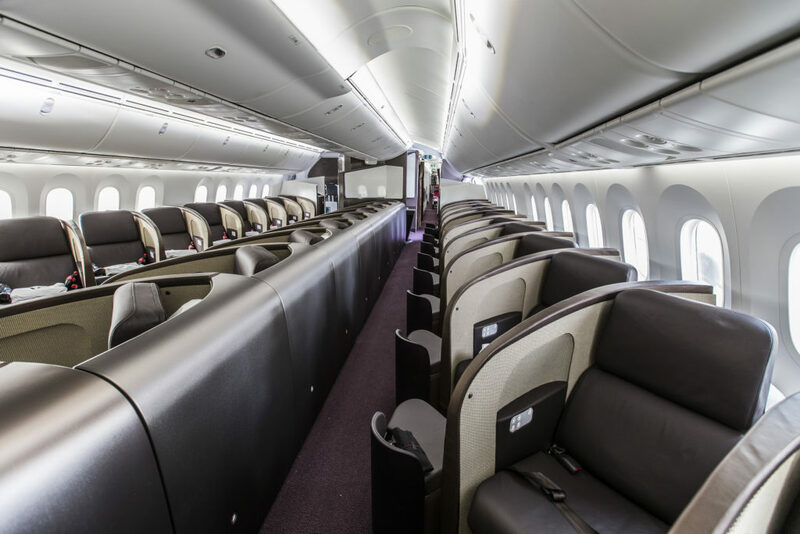 I have just attended a fantastic event with Virgin Atlantic at Gatwick where they unveiled their new seats for their A350-1000 aircraft which are due to start flying from London Heathrow to New York’s JFK in August. Virgin really know how to put on an event unsurprisingly! 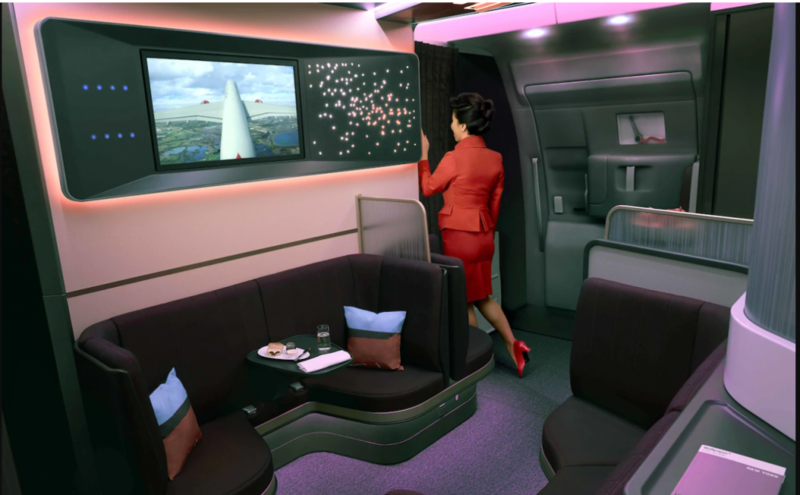 The event included a full cabin mock-up of both the bar and Upper Class seats. Thanks as ever to TLFL’s photographer Marek for capturing some great shots! Virgin has ordered 12 Airbus A350-1000 and will take delivery of the first one mid-2019. These will replace the B747s that will be phased out by 2021 for Virgin. The A350 flights to JFK are on sale this month with the airline’s first A350 which will be named Red Velvet. 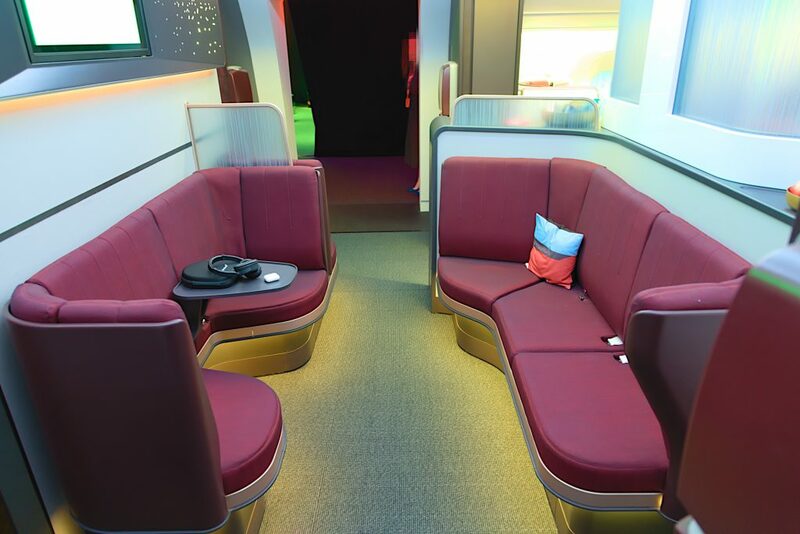 The seats are laid out in a 1-2-1 configuration which is a departure from the uniform rows of seats in Virgin’s current Upper Class. Gone is the old style Upper Class bar which has been replaced with the Loft, which as well as being the hotel lobby style entrance, has seats for 8 people. 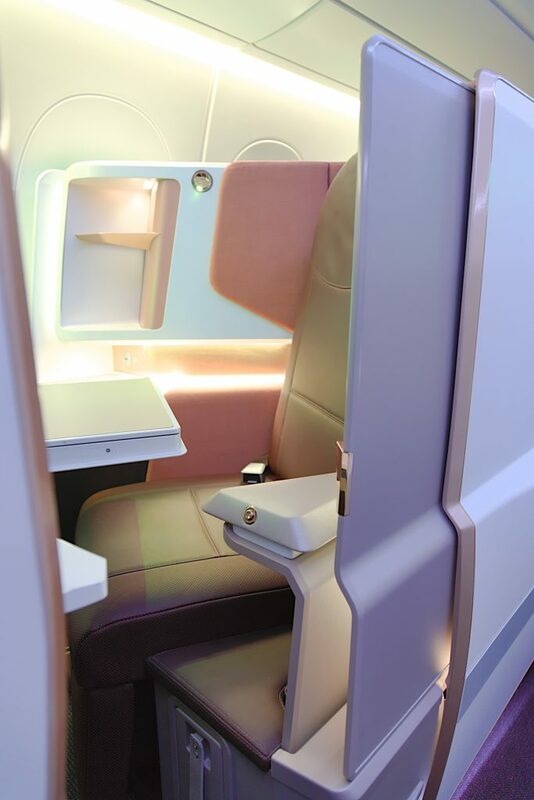 The lounge seats are in keeping with the style of those on Qatar and Emirates A380 lounges. 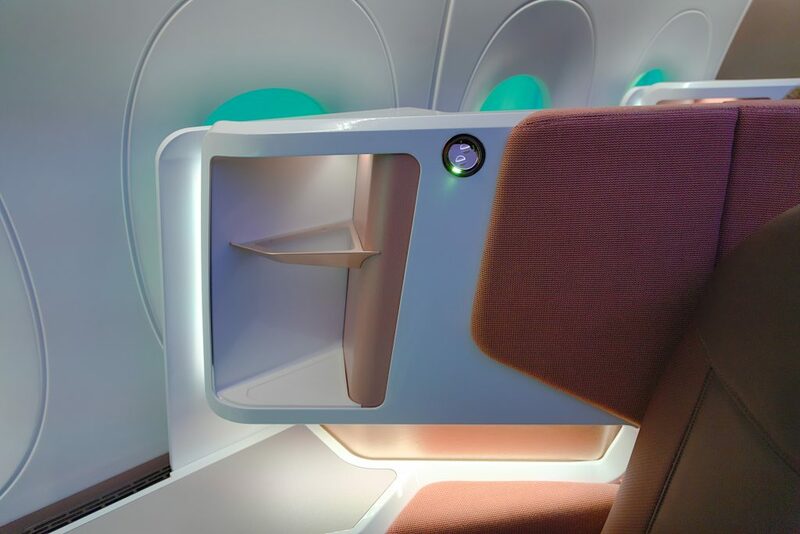 Having lower bench style seats means that they can have seatbelts, unlike the previous bar stools. The bar will also have proper food with a new “bowl food” menu. There will be a wide range of cocktails too. 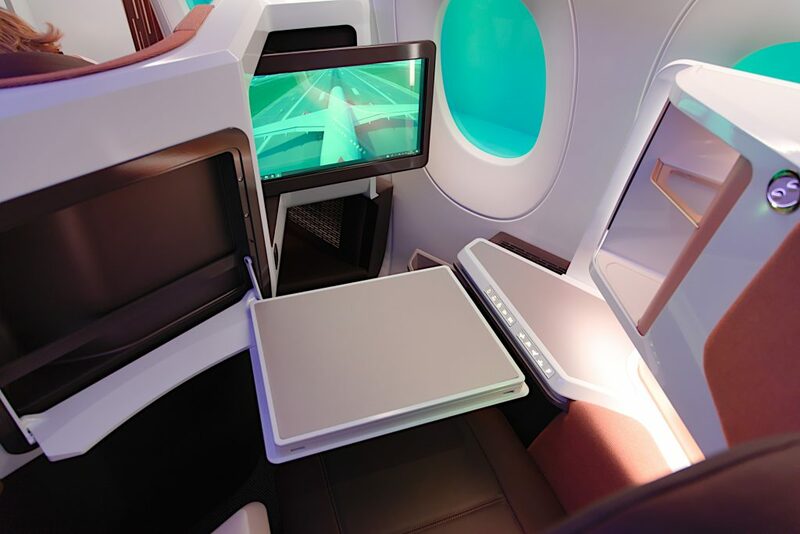 Although there’s a large 32-inch TV screen to watch films or live sports which will be bespoke content for the bar, they will at least provide blue-tooth headphones for it which is something I haven’t seen before on board. There are eight Bluetooth audio jacks to enable customers to view content together with their own headphones or the Virgin ones provided. Although I will definitely be avoiding seats near the bar due to noise, it is much less open to the cabin than the previous bar which is good. Another feature I have not seen before will be in this area – a stand-up desk designed so that two people can work on their laptops. Though I can see this being more a social area personally. 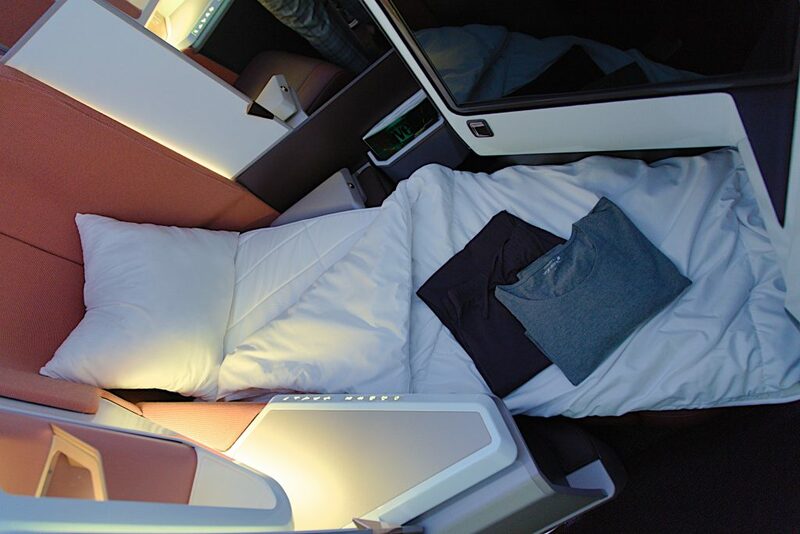 The Upper Class cabin will have 44 suites in a 1-2-1 configuration. 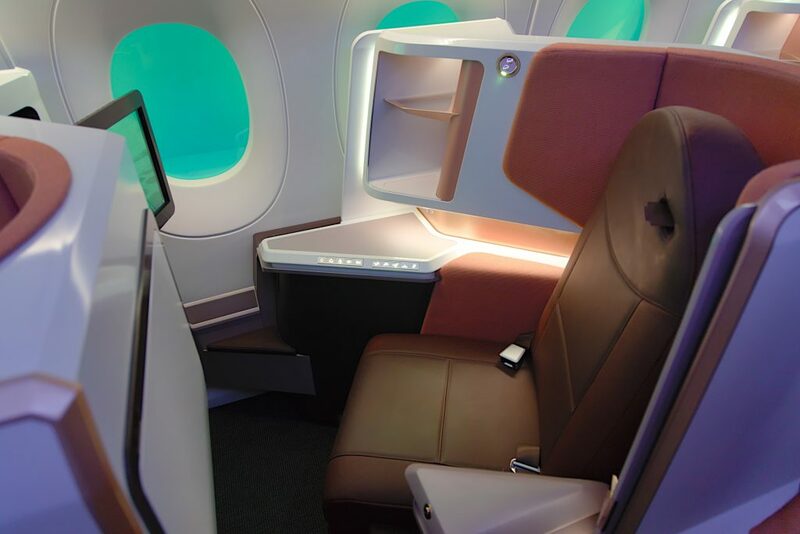 Unlike the old seats, they face forwards and outwards towards the window. One of the things I liked least about the old seats has also gone. Now the seats will no longer have to be flipped over to transform it into a 20″ wide by 82″ flatbed. This should give a much better choice of recline positions than before. 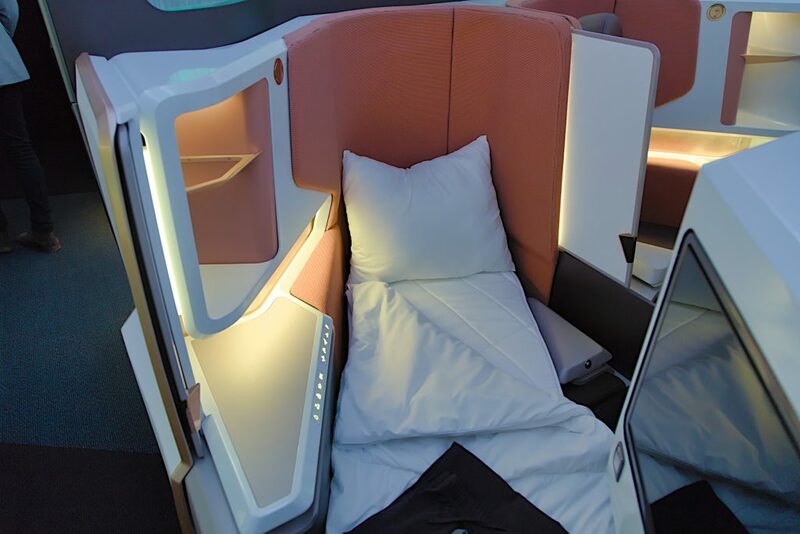 I am not overly keen on small footwells which I find a little restrictive when sleeping but to be fair nearly all airlines are going for this design (Iberia is one of the better examples). This is because it allows them to install more premium seats by putting your feet under the seat in front in effect. BA have gone for a full door whereas Virgin have gone for a “half privacy door” They advocate this as perfect for maintaining contact between crew and passengers but I am not sure I totally see the point of having it at all if you can’t close it. To be fair the suites do feel pretty private due to the layout anyway. We particularly liked the table that folds into the side of the suite meaning that it does not intrude on the sleeping space as it does on some products. It felt like a large and very sturdy table. 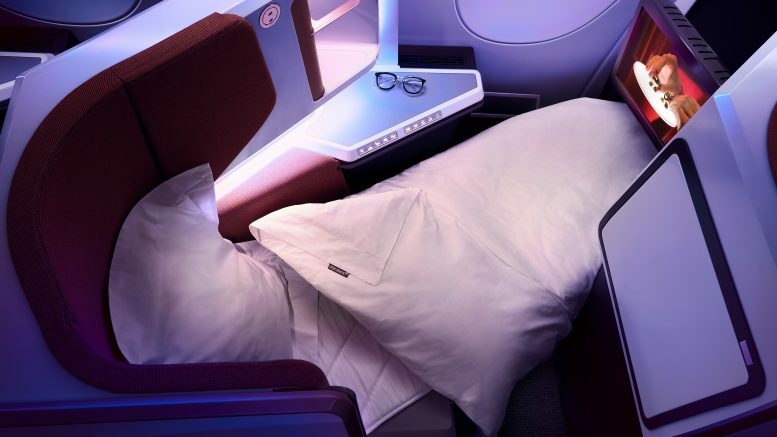 There is a much bigger 18.5-inch TV screen; personalised mood lighting in each suite, with better reading lights; a deep mattress and the thickest pillow in the sky according to Virgin. 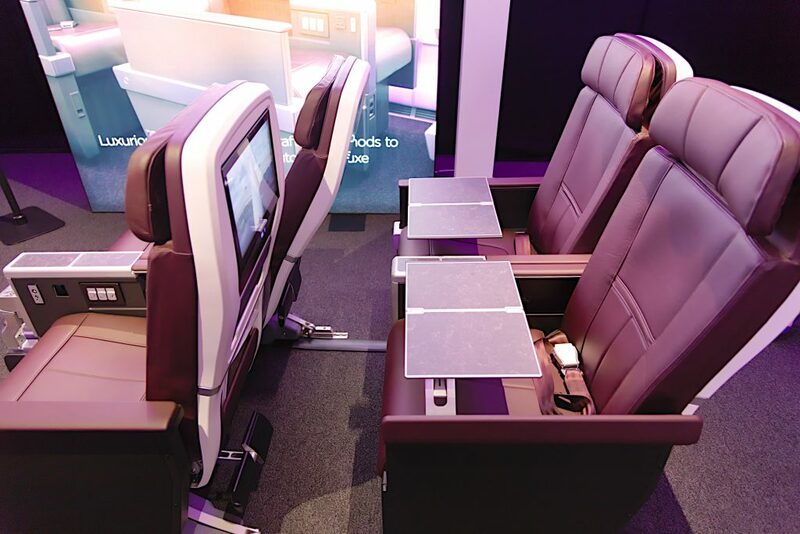 You can connect to the inflight entertainment via Bluetooth and enjoy wireless freedom on board which is a real step forward for those of us that like their own headphones such as the Bose QC35 that I use. 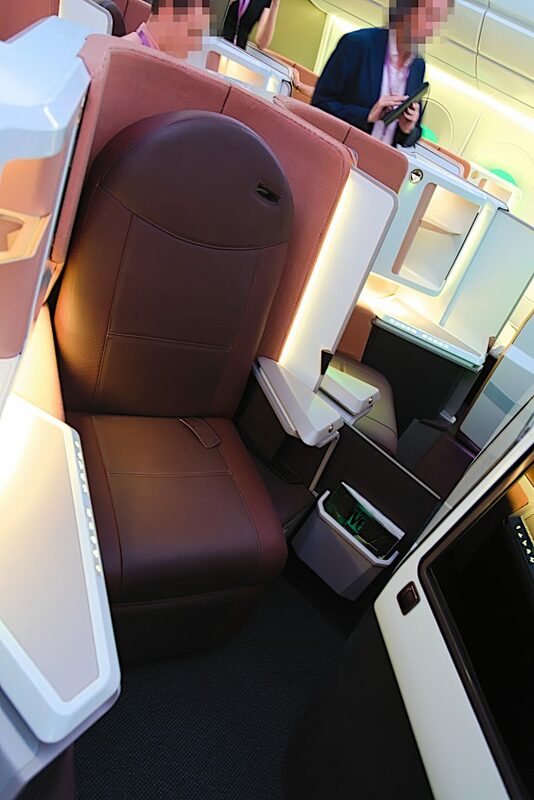 All Upper Class suites feature two USB sockets, and an AC socket adaptable for UK, US and EU plugs. I also like the fact that the seat controls include a button for pausing and playing the entertainment and volume if you want to do something quickly and easily. I love the sound of the pre-ordered personalised pyjamas – trousers or shorts and long-sleeve top or T-shirt. I often find the long sleeve tops way to hot so its great to get a choice and know they won’t have run out of your choice. The new amenity kit will have much larger toiletries so you don’t have to pack any. There will be new food in all cabins, with a focus on breakfast and afternoon tea. The new service will feature quicker to serve options. There will be the option for customers to dine together and enjoy Mile High afternoon tea by Eric Lanlard and a selection of delicious new dishes by Donal Skehan. “The introduction of our A350 represents a true evolution of our customer experience. We believe flying should be exciting, whether it’s your first or 100th flight with us and that’s why we’ve elevated our offering to provide our customers with something totally unique. The A350 forms a significant part of our fleet transformation strategy and by 2022, we’ll have our youngest, cleanest, greenest fleet in the sky as the aircraft transforms our customer experience, reduces our environmental impact and improves our route economics. 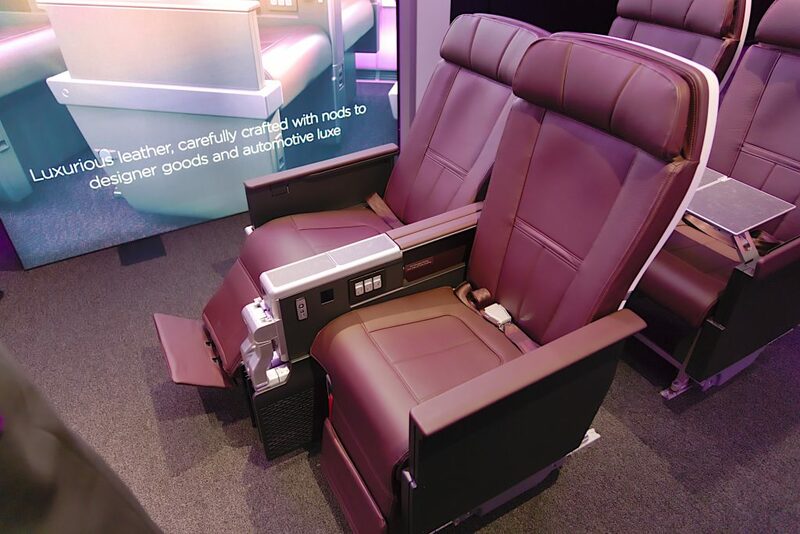 2 Comments on "Virgin Atlantic unveil their new A350 Upper Class and Premium Economy seats"
The premium economy seat looks less comfortable than the current seat – also think it’s 1.5inches less wide! Shorts…no! Do we really need to see the unsightly stuff? Thankfully they don’t have tank tops. Yet.